Religion is a nearly ubiquitous sociological phenomenon. In almost every place where man scratches out a livelihood, there exists an organized set of beliefs that explain the greater mysteries of life through supernatural means. The embedded concept that each faith claims a monopoly on access to the afterlife is also prevalent to near unanimity. This is often observed as the mutual exclusivity of religion, that there is only one path to god. The logical conclusion of this is the obvious: only one is right, or all are wrong. The constituents of the religious plurality that internalizes this logic exist, in their own minds, as the sole benefactors of the creator of the universe. Comprehending what makes these tendencies common to most faiths is essential to understanding the origins and significance of religion in its entirety. Budding religious movements in modern history offer some of the most reliable and well-documented evidence for the organic development of organized and complex systems of supernatural worship. One series of beliefs, called cargo cults, emerged as a widespread phenomenon during World War II, and serve as a fascinating study on the circumstances through which religion naturally forms. 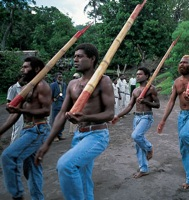 The term cargo cult loosely refers to religions which associate material wealth with ritualistic ancestor worship. They exist most predominantly in island civilizations, particularly those of larger Melanesia. Like a rudimentary form of prosperity gospel, these faiths believe that religious dedication results in the accumulation of valuable materials, typically from the goodwill of deceased ancestors interacting with the living from the afterlife. Evidence suggests that cargo cults existed long before recorded history. The bounty of the ocean swept in by tides, unnatural and strange seeming as it was, required equally as elaborate an explanation. Flotsam and jetsam, strange marine life, and the many other eccentric oddities washed ashore were viewed as gifts from the divine. As time passed, explorers and wayfarers alike made contact with people from this variety of faith. Arriving from the open ocean, these travelers were viewed, on occasion, as the risen ancestors of the island inhabitants. The obviousness of mortality makes this a hard ruse to maintain, and with rare exception does evidence suggest long-term worship of these seafarers. What goods they had, however, when given as tribute or obtained through trade, were attributed to a divine source. The indigenous islanders constructed miniature docks and jetties where they performed rituals seeking to summon goods from their afterlife, somewhere in the distant stretches of the ocean. During the age of exploration, attempts by missionaries to proselytize and convert these inhabitants met with great resistance. In many situations, it was the gift of goods and trinkets from missionaries that facilitated a dialogue about the divinity of the god they sought to represent. No time in history saw a greater movement of people through the southwest Pacific than during the Second World War. This flood of personnel, war machines, and supplies was truly epic. As territory shifted, alternating powers occupied islands inhabited by people of this long religious tradition. The construction of harbors and airports on remote islands meant tens of thousands of troops and their equipment came in contact with cargo cult practitioners in a very short amount of time. This period of rapid development combined with the scorched-earth hell wrought by modern warfare rendered the homelands of these cargo cultists the battlegrounds of gods. Without knowledge of advanced technology, things like battleships, airplanes, and high-explosives were mind-boggling and otherworldly. It was Clarke’s Third Law in action – any sufficiently advanced technology is indistinguishable from magic. The island-hopping strategy employed in the Pacific meant that some islands were only inhabited for a brief period of time. Following the close of the war, many points of prior strategic importance were vacated. Cargo cultists, mostly oblivious to geopolitical happenings, found themselves in a spiritual vacuum following the departure of modernity. Having had their age-old prophecies fulfilled by the flood of advanced technology and cornucopia of food brought in by the ocean, the rapid evacuation of goods and personnel was both anti-climactic and confusing. As in times past, cargo cultists enacted rituals around crude mock-ups of modernism in an attempt to rejuvenate the supply of heavenly goods. Many instances of similar behavior emerged on widely separated islands. Aspects of military life were ritualized, with islanders marching and performing drill routines carrying crude wooden replicas of firearms. Control towers were fabricated from bamboo and staffed by wooden headphone wearing villagers. Full-sized airplanes were built from straw. Airstrips were maintained and signal fires lit to help guide in the expected cargo flights from the hereafter. This still occurs today. Inhabitants on the island of Tanna in Vanuatu worship a mythical serviceman from WWII named John Frum who they believe will bring them wealth and prosperity. Many wish to return life to the wartime 1940’s, and do not see 21st century technology as preferable. They want to return to their religion’s golden age. While dissimilar in many ways from major world religions, appreciating the origins of cargo cults illuminates many of the ways in which all religions are the same. Man’s search for understanding and meaning in his surrounding world is both the origin and ongoing undercurrent of all religions. Charismatic leaderships, ritualistic worship, and “second coming” events are prevalent in world religions in much the same was as cargo cults. Ultimately, the central pillar binding all religions together is that they are man-made. As such, their creeds come ridden with the insecurities of humanity, coupled with its deepest fears and most fantastic hopes. ~ by Wil Finley on February 23, 2010. I’ve been waiting on this topic for a while. Well done, sir.